Containment Protocols: MST Operative Camp Hati-01 is to be stationed within a kilometer of RPC-054 in order to routinely monitor for any interference during a Battle Event. Any object, substance, or individual found attempting to interfere during said event are to be subdued, removed and terminated as swiftly as possible. If the interference is unable to be subdued and/or terminated, all personnel are to immediately evacuate to areas at least 0.8 kilometers away from RPC-054. The Authority is to work with the Norwegian government in order to ensure that the existence of RPC-054 is not revealed to the general public. Description: RPC-054 is a group of three hundred individuals who reside on a tundra plain 4.02 kilometers north-east of the Glittertind mountain in Norway. Said individuals are divided into two "tribes", one calling themselves the Varúlfr, meaning "Werewolf", and the other being named the Angrivarii, meaning “the men of Engern”. Both tribes are evenly divided, each having exactly 150 members. All individuals on both sides appear to be dressed in the style of Eleventh century Viking battle garments, and can be seen armed with battle axes, spears, shields, horses and longbows. Each of the tribes also appear to have their own camps, consisting of sleeping tents, meal huts, battle practice ranges and stables. No social hierarchy is apparent within any of the tribes, with all members claiming to be the same title of "warrior" instead. Both of the tribes that make up RPC-054 are believed to be locked in a continuous cycle of day-to-day conflict. The fights between the two tribes, known as "Battle Events", begin at Dawn and only end once there is a clear victor. A victor is only determined once a single individual from either tribe remains. After a battle ends, the remaining individual will remain stationary for a few moments until they are engulfed in large amounts of golden light. Said light will continue to shine for up to five seconds until it disperses, in which the victor will then appear to have vanished. During nighttime, a dense fog covers the tundra area that RPC-054 resides on making it impossible to navigate without the appropriate technology. It should be noted that it is impossible to enter any of the sleeping tents while the fog is active. At exactly 4:00 AM, all members of both tribes appear to open and exit their sleeping tents, where they then proceed to engage in their own morning activities prior to the day's battle. Studies have shown that the victor from the prior day's battle is not among those who wake up during the new day; instead a new individual will appear in the previous victor's place. The appearance of this new individual does not appear to confuse any other members of their tribe; instead they will act as though the new member has been in the tribe long prior. During a Battle Event, all tribesmen demonstrate heightened levels of warlike attitude, and are hostile to any individuals that are not part of their respected tribe. However, this hostile nature has not been shown to carry over during the time period when both tribes are resting at their camps, and appear to be open to discussion with Authority personnel. Testing has shown that outside forces are capable of influencing the events of the conflict within RPC-054. However, any interference will prove to yield harmful consequences to the area around it. These consequences typically include an increase in natural disasters throughout the world and a heightened spread of disease. Due to the existence of multiple historical documents and paintings that presumably depict certain Battle Events of RPC-054, it is believed that RPC-054 has existed for more than █████ years. On January 6th 1237, merchants from the village of Galdbygde, Norway discovered RPC-054, and attempted to trade with the Tribes prior to the start of a Battle Event, leading to all merchants except one being slaughtered. 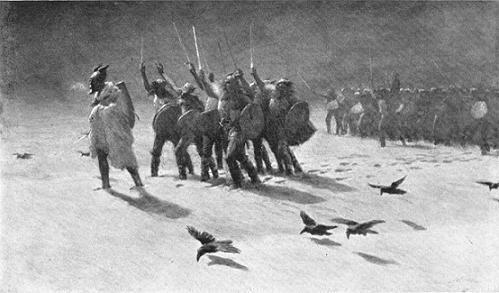 The people of Galdbygde retaliated with a force of one hundred men. What is known as The Battle of Skömm (Shame) took place on January 14th. Out of the original one hundred, only eight of the men sent into battle survived. This event is notable because all members of both tribes express a perfect recollection of the Battle itself despite it occurring centuries prior. The following document is an excerpt from the diary of Birger Felmen, one of the survivors who fought against the Varúlfr and Angrivarii tribes. […] As we climbed over the hill crest, we were able to make out a large crowd of people who appeared to be engaged in battle. Captain Marius told us that they where the men that the merchant had sent us to kill. I questioned him, asking if it was truly best to attack such a large amount of men when engaged in such a way. He told me that this was the most opportune time to silence the enemy. And so we went. We prayed for Tyr to guide us on our journey, and then, like cats, we crept up from behind the enemy and prepared to strike with vengeance burning within our hearts. What happened next, no god nor mortal could foresee. When Captain Marius gave us the order to charge, it was as if the enemy instantly knew of our presence, and unified against us! They charged, oh how they charged, with such relentless speed that I froze in my tracks. My feet felt like they had become part of the ground that I walked on. The other men, men much braver than I, clashed the enemy with intense brutality. Despite their resolve, the enemy tore swiftly through our ranks. These beasts that wore the skin of men hacked us to pieces. In the midst I could see Captain Marius' detached head fly out among the commotion. The cold air froze my throat as I watched my friends die as warriors. And suddenly, as though an eternity had passed, I was shaken by one of the few living men left. He yelled one word in my face twice, "Retreat". As my mind awoke and became aware of the living atrocity charging towards me, life once again surged through my feet, and I ran as fast as I could away from danger. We were fortunate enough that the enemy did not follow us for a long distance. I recall running only for a minute or so before the enemy stopped and appeared to re-engage themselves with fighting one another. My walk back to Galdbygde was one full of anguish, and self hate. I know that my soul will forever rot in the depths of Helheim for my cowardliness. Note: Following the battle, an earthquake with a magnitude of 5.5 occurred near Galdbygde, causing an avalanche on the nearby Glittertind mountain to fall onto the town. Document 054.02: The following document is an interview log translated from Norse into American English. Ali: Your name is Kórekr Nesbjörn, right? Ali: Alright. How long have you been here, fighting? Kórekr: About as long as I can remember. Ali: Do you remember having any family at all? Kórekr pauses, appearing to think over his choice of words. Kórekr: I did…once. Many moons ago. Ali: What happened to them? Kórekr: I am not sure. None of us remember our families very well. All we really think about is…fighting. Ali: Do you remember why your tribe is fighting the Varúlfr? Kórekr: Other than killing them because they are bastards? No. Ali: So your tribe has a grudge against them? Kórekr: They are- they are evil. Ali: How are they evil? Kórekr motions for Ali and the accompanying security guard to follow. He leads them to a tent on the north west side of the camp. Kórekr: Go to the back. Ali and the Security Guard walk around with Kórekr to the back of the tent. Ali: Ok, what's going on? Kórekr: We know why you're here. Ali: What? What do you mean? Kórekr: We know your purpose for seeing us. Ali: And what is that exactly? Kórekr: You know that we are…strange. We do things that are not normal. The truth is, I do not know why we fight the Varúlfr. None of us do. Ali: You're aware of everything that's going on here? Ali: Then why do you keep fighting? Why not just walk away and join the rest of the world? 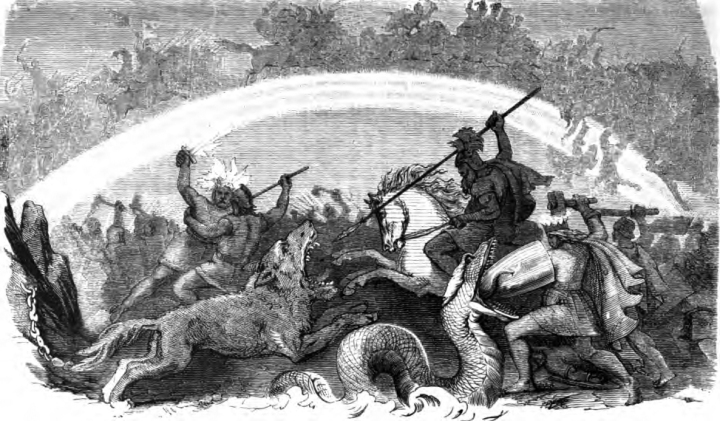 Kórekr: Do Sköll and Hati still chase the Sun and Moon? Kórekr: Then you know why we must keep fighting. Ali: But that doesn't make any sense! You're not fighting for anything. You're just spilling each others blood for absolutely no reason! Kórekr: That is not true. We fight for one purpose, and one purpose only. Ali: And what is that? Kórekr: Our spilled blood is what prevents the coming of Ragnarok. Ali pauses for a few moments, but then eventually resumes speaking. Ali: But..but why? Why you? Kórekr: I do not know. Perhaps it is the will of a benevolent Aesir. Or even Odin himself. But it does not matter. We are aware of our purpose and what must be done. Ali: But what about the outsiders you've killed? What about The Battle of Skömm? Kórekr: It is a pity but…it was necessary. Ali: Do the lives of others mean nothing to you? Kórekr hesitates before answering. Tears can be seen falling from his eyes. Kórekr: There is not a day that goes by where I do not regret what happened that day. Every part of my being screams with the anguish of those I have slaughtered. My humanity feels as though it has been stripped away and replaced with the desires of a beast. The things that I have done to others, no man deserves. And every day, I must go out and slay others that I have no quarrel with, as well as watch my own friends die before me. Again, and again. So yes, I do what must be done, but I do it for the sake of this realm. So that others may not suffer as we do. Kórekr: It matters not. If we are to survive then we must continue our conquest. However, I feel as though my time may be up soon. Ali: Do you mean you'll be the survivor? Kórekr: I do not think. I know. It will be very soon, perhaps even this very next battle. My soul will leave this wretched field and move on to Valhalla. Ali: You know that the victors go to Valhalla? Kórekr: I do not know for sure, but it is still my belief. And it brings me comfort to think that my friends are up there right now. Ali: I…you're right. I hope everything goes well. Kórekr: Thank you. I think you should leave now. I do not wish for you to be caught up in our quarrel once we fight again. Ali: I will. Good luck. Closing Statement: Following the interview, Kórekr was found to be the days Battle Event victor, and disappeared under the same light that others had before him.